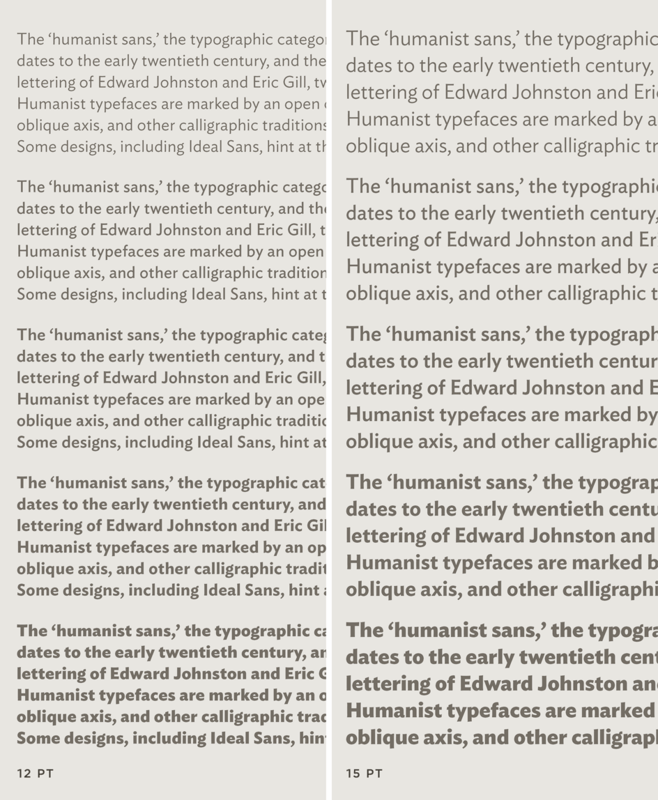 Ideal Sans Font Features: Size Proficiency | Hoefler & Co. Distinctive italics, a design that anticipates bolder weights, and a deep character set all combine to make Ideal Sans a perfect choice for text. A typeface may be legible at small sizes if it has clear shapes, a large lowercase, open apertures and generous spacing, but to work for text it must meet other requirements as well. Readers have expectations about the roles of italics and bolder weights, and designers need the proper tools to render complex information from acronyms to financial data. Here are some of the ways Ideal Sans helps meet the needs of both readers and designers. In text, an italic must be easily distinguishable from its companion roman. This can be a special challenge in sans serifs, where italics are often imagined as nothing more than obliqued romans; simply slanting a typeface often does little to change its texture, and can result in romans and italics that are insufficiently different at small sizes. Ideal Sans follows a strategy more commonly associated with seriffed designs, employing an italic whose structure is entirely unrelated to the roman. Its cursive tendencies, elliptical forms, and narrow gait produce a comparable color but a distinctive texture at small sizes. These same details help give the design different voices at large sizes, making Ideal Sans both a reliable family for text, and a versatile family for display. As they become bolder, all typefaces become selective about where they take on additional weight. In order to safeguard the critical white space within letters, certain strokes are favored over others, a phenomenon that can compromise sans serifs whose identities rely upon consistency of line. Because Ideal Sans introduces contrast in even its lightest weights, the typeface is able to maintain both its integrity and its personality across an especially wide range of styles. The capital letters in Ideal Sans follow classical proportions, their widths varying greatly between narrow letters such as E and S, and square ones like H and D. These tendencies give capitalized words the same sort of lilting rhythm as lowercase text, and makes the design a natural candidate for the inclusion of small caps. Ideal Sans features small caps across all eight of its weights, and less commonly, includes eight weights of italic small caps as well.